The Spin Down filter is renewed by simply opening the ball valve and allowing water pressure to purge the filter. A hose can easily be attach to direct water. 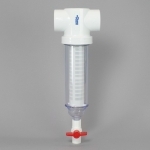 This “spin down” style sediment filter traps large particles and supports a high flow rate. 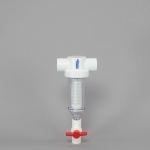 It is manually purged by opening the valve (red handle) which blows out trapped particles and renews the filter. Spin Down filters use replaceable screens (visible through the transparent housing) that are usually measured in mesh sizes rather than microns. With microns, the filter gets tighter as the numbers get smaller. With mesh, the filter gets tighter as the numbers get larger. 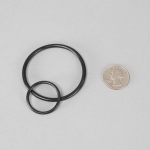 For comparison, one hundred mesh is about 150 microns; sixty mesh is about 250 microns .Of the two sizes featured here, 100 mesh is a tighter screen than 60 mesh. The spin down filter, sometimes called a spin out filter, is an effective and easy-to-maintain sediment filter. 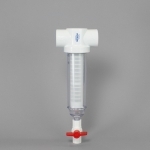 The clear cover allows quick viewing of collected sediment to know when purging is needed. 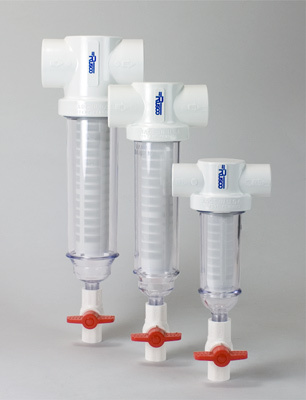 Spin down filters allow high flow rates as compared with most other types of sediment filters. 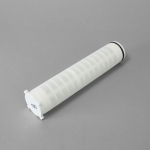 The spin down filter uses an easily cleaned and reusable polyester filter screen. The most popular model is 100 mesh (about 150 micron), ideal for medium duty filtration of sand, grit, pipe scale, etc., but both coarser and finer screens are available. 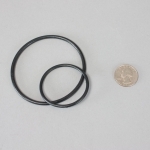 The unit is offered in three pipe sizes: 1 inch, 1.5 inch, and 2 inch. The one-inch model supports flow rates up to 20 gallons per minute (gpm), appropriate for most residential applications. The 1.5" model can handle up to 50 gpm, and the jumbo-sized 2" model can handle up to 90 gallons per minute. Each spin down unit comes with a flush valve which allows quick and easy purging of collected sediment. 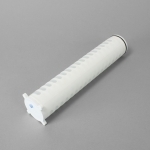 The spin down filter is an extremely versatile water treatment tool. It is so light that it can be supported by the pipe in which it is installed. No mounting bracket is needed. 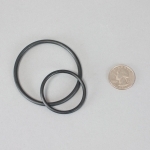 Maximum operating pressure for these units is 150 psi. Spin down filters are designed for easy installation on PVC (glue on) or they can be easily adapted to other pipe styles with a glue-in adapter. Prefilter for “inline” tank style carbon and neutralizing filters to prevent intrusion of large sediment. 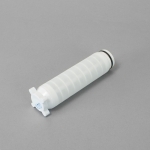 Postfilter for “inline” tank style filters to prevent media migration into service lines. Whole house sediment treatment for large particles like sand and grit. It also serves as an excellent prefilter for finer sediment filters to protect them from premature clogging. An excellent “insurance” filter to protect against sediment intrusion from unexpected breaks in piping even in very clean city or well water. 1" ports for flow rates up to 20 gpm. 1.5" ports for flow rates up to 50 gpm. 2" ports for flow rates up to 90 gpm. Note: Replacement screens to fit these filters are are available in other mesh sizes and can be ordered by phone. Please inquire.